The Hoh Rain Forest is located in Washington State, on the very green Olympic Peninsula. This impressive forest is protected inside the Olympic National Park. Visiting the Hoh, is almost a rite of passage to pacific northwest natives. You really should see it in your lifetime! The Hoh is most famous for its huge trees and hanging mosses. It also is recently became more in the limelight, for being featured on TV programing. Be sure to visit in the off season, to beat the crowds. Additionally, this forest also receives a very healthy dose of rain annually, so make sure to protect your hiking gear from the rain. The Hoh Visitors Center is located 18 miles off of Highway 101. That is where the Hoh Trails start, so be sure to stop in and get a map. Asking a ranger about current weather forecast and trail conditions is also advised. There are restrooms and trash at the facility. Word of warning, the parking lot often overflows during peak visitation times. So plan your visit in the off season or bad weather. Want to learn more? 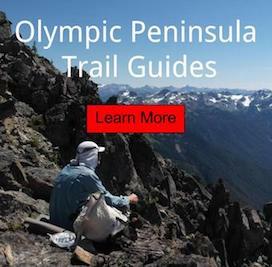 Complete trail guides and maps to Olympic National Park. The Hall of Mosses Trail is just under a mile long. The trail wanders through old growth forest, big leaf maple trees covered with hanging mosses and you might even be lucky enough to see wildlife. This part of the forest is a perfect example of what was once more common on the Peninsula; before logging. The Hoh River Trail is 18 miles long and leads to Blue Glacier (Mount Olympus). The first 13 miles of trail is relatively flat, before leaving the valley floor and climbing into the mountains. For this reason, the lower elevations of rain forest bottom, is a getaway for weekend camping. Backcountry campsites are generally scattered every 2.5 to 5 miles apart and require a backcountry permit. The Spruce Nature Trail shares the same trailhead as the other two trails. The Spruce walk is just over a mile in distance and leads you toward the Hoh River. This loop hike gives you an opposite feel of the forest, when comparing it to the Hall of Mosses area. Plus, it gives you a view of the river, so it's a win-win. If a hiker has time, do them both! The Hoh Rain Forest has a car campground that is located adjacent to the Visitors Center. This drive-in campground is open year around and has 88 available sites (weather pending). These sites are first-come-first serve, so plan accordingly. They have restrooms and fresh water available nearby. The best time to visit, is during the winter months, to avoid heavy crowding. Get out there and have fun!